Maps enjoy a long tradition as a mode of literary illustration, orienting readers to worlds real and imagined. 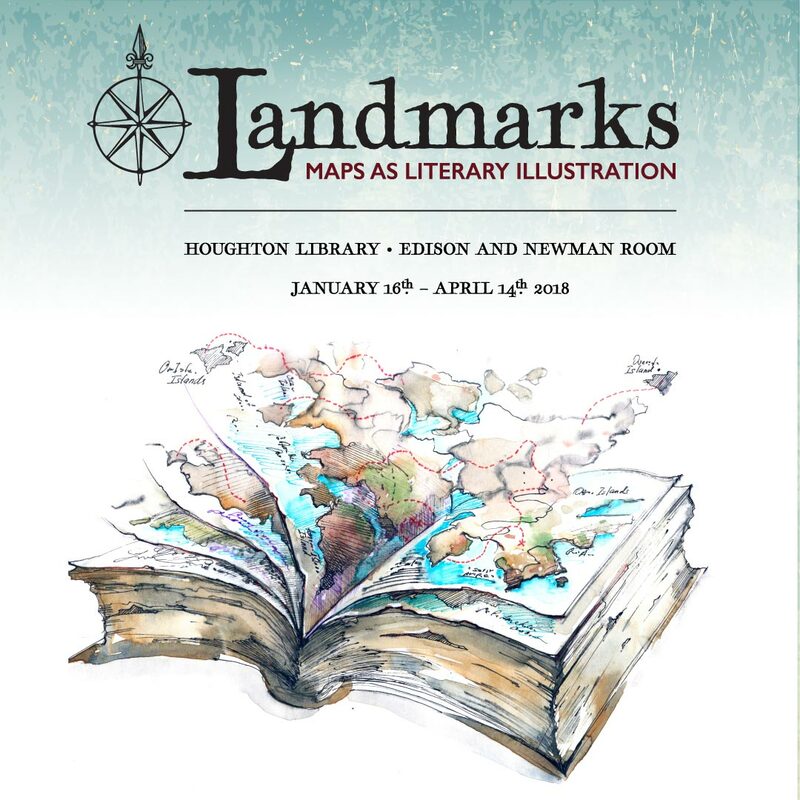 Presented in conjunction with the bicentenary of the Harvard Map Collection, this exhibition brings together over sixty landmark literary maps, from the 200-mile-wide island in Thomas More’s Utopia to the supercontinent called the Stillness in N. K. Jemisin’s The Fifth Season. Visitors will traverse literary geographies from William Faulkner’s Yoknapatawpha County to Nuruddin Farah’s besieged Somalia; or perhaps escape the world’s bothers in Pooh’s Hundred Acre Wood. 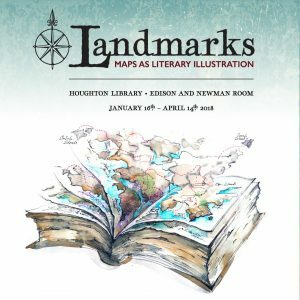 At this intersection of literature and cartography, get your bearings and let these maps guide your way. The French Enlightenment is famous for its intellectual innovations, but it is remembered largely as a male endeavor. However, recent scholars have shown that French women were active in all genres, from novels to physics. Despite systemic sexism, these writers produced literary and academic works that were neglected in their own times as in ours. 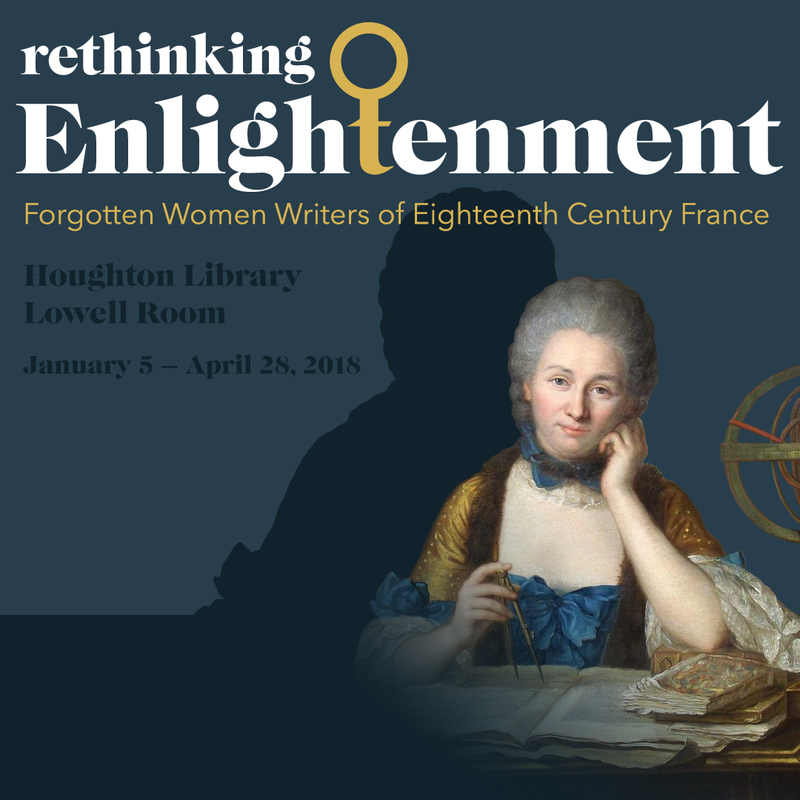 “Rethinking Enlightenment” showcases Houghton Library’s remarkable holdings of texts by eighteenth-century French women. Beyond describing how these writers critiqued their society, the exhibition demonstrates their active participation in the philosophical and artistic development of modern France. For scholars of the Enlightenment to anyone interested in women’s history, it is a timely reminder of the forgotten figures in intellectual history. Caleb Shelburne, Class of 2018, guest curated this exhibition while working as a research assistant for Christie McDonald, Smith Research Professor of French Language and Literature and Research Professor of Comparative Literature, whose 150-page essay on 18th century French women writers will be published in the forthcoming two-volume Femme, Littérature. Une histoire culturelle (Paris: Gallimard, 2019). This important new scholarly work will chart the contribution of women to French literature from the Middle Ages through the 21st century. 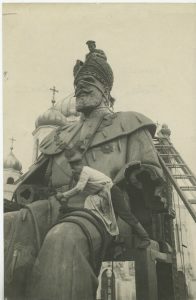 The Russian Revolution has been called the most momentous event of the last century. To mark its centennial, Houghton Library presents an exhibit showcasing original documents from the period, assembled from its own holdings as well as those of other Harvard Library collections. Highlights include handwritten notes by Lenin, and photographs and manuscripts of journalist John Reed. Together, these striking artifacts tell the story of the Revolution's leaders, their opponents, the thousands of ordinary people they mobilized, and the American expatriates who witnessed these events first-hand. Centenary of the Russian Revolution at Harvard This exhibition is presented in collaboration with the Davis Center for Russian and Eurasian Studies and the Slavic Division at Widener Library. 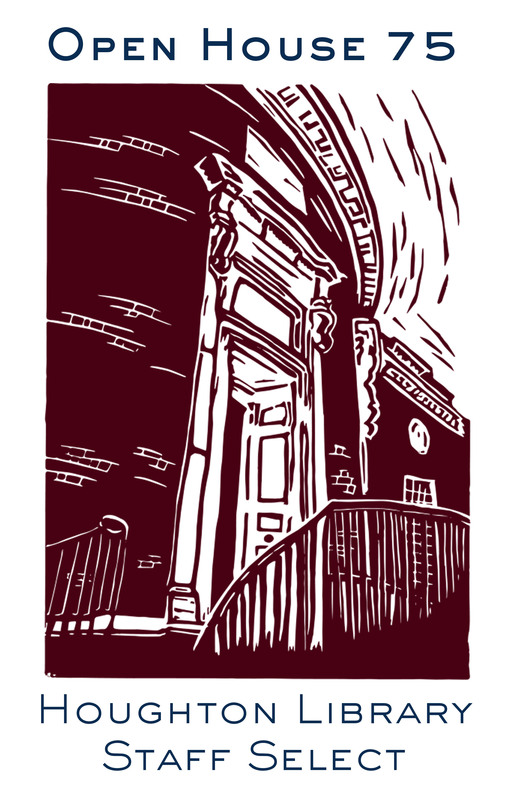 It forms part of a number of commemorative events taking place across Harvard in the fall of 2017. For further details, visit the Davis Center’s website. This exhibition presents a rare opportunity to see a dozen original photographs from the earliest days of photography on paper, as invented by William Henry Fox Talbot in late-1830s England and practiced by him and a circle of friends in the 1840s and 1850s. On display will be photographs by Talbot himself, including his landmark publication, The Pencil of Nature, and photographs by some of his earliest followers, Calvert R. Jones, John Dillwyn Llewelyn, and Nevil Story Maskelyne. Also included are early photographs of manuscripts and printed books in the collection of the famous British bibliophile Sir Thomas Phillipps. 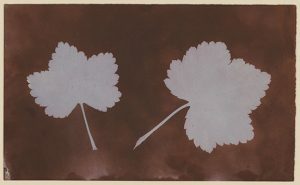 Prone to fading already in their day due to the experimental techniques used to create them, these light sensitive prints are on view for five weeks only. 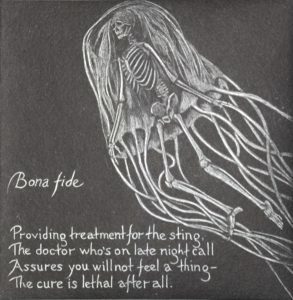 View the exhibition with Hope Mayo, Philip Hofer Curator of Printing and Graphic Arts, on Tuesday, September 26, 12:30-1:00 pm, and Wednesday, October 11, 5:30-6:00 pm, and by appointment. 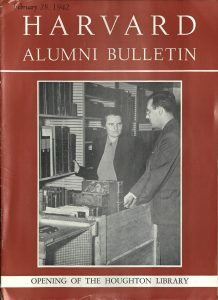 For further details, email houghtonlibrary_events@harvard.edu. Salted Paper Prints This exhibition is presented in conjunction with the two-day symposium Salted Paper Prints: Process and Purpose: A Collaborative Workshop in Photograph Conservation (September 14 – 15, 2017). For further details and registration see the symposium website. As scholars, teachers, politicians, and pundits debate what America is and means by reimagining or rewriting the America in which we live, it is worth recalling the America actually lived in and written about by the country’s first generation born after the American Revolution. 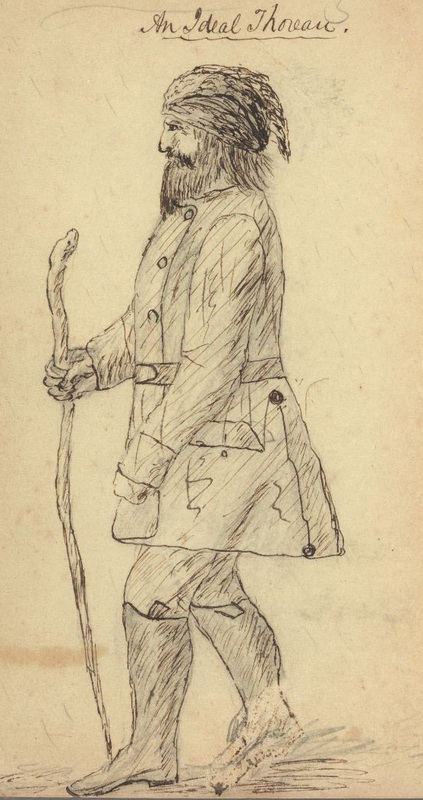 The bicentenary of Henry David Thoreau, who was born in Concord, Massachusetts, on July 12, 1817 and died there on May 6, 1862, provides such an occasion. A contemporary of Ralph Waldo Emerson, Nathaniel Hawthorne, Margaret Fuller, Walt Whitman, and Frederick Douglass, Thoreau did not always share in the prominence they enjoyed. 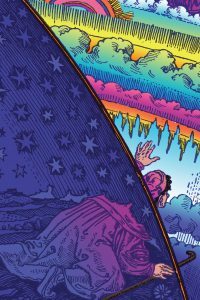 Although his story invariably opens with reference to Emerson, Emerson’s belief that American exceptionalism was synonymous with capitalism made for a stark distinction between the two, a distinction Thoreau underscored in 1853, writing, “I am a mystic—a transcendentalist—& a natural philosopher.” The dominant Thoreau who has emerged among recent generations of readers is an environmentalist who argued for the restoration of the landscape with which humankind was originally blessed, a humanitarian who read capitalism as the supreme threat to individualism and equal rights under the law, and a political thinker who critiqued the popular concept of exceptionalism as promoting destructive impulses such as the virtual eradication of Native American culture and the extension of slavery into the American West. The recently discovered notes on his search for Margaret Fuller after her shipwreck. The exhibition was curated by Ronald A. Bosco, Distinguished Research Professor of English and American Literature, University at Albany, SUNY, and contributes to the Thoreau Bicentennial, a year-long celebration of Thoreau’s 200th birthday taking place around the world. John Lithgow enrolled at Harvard in 1963, intent on becoming a painter. Even as a professional actor, he has never lost interest in the visual arts. 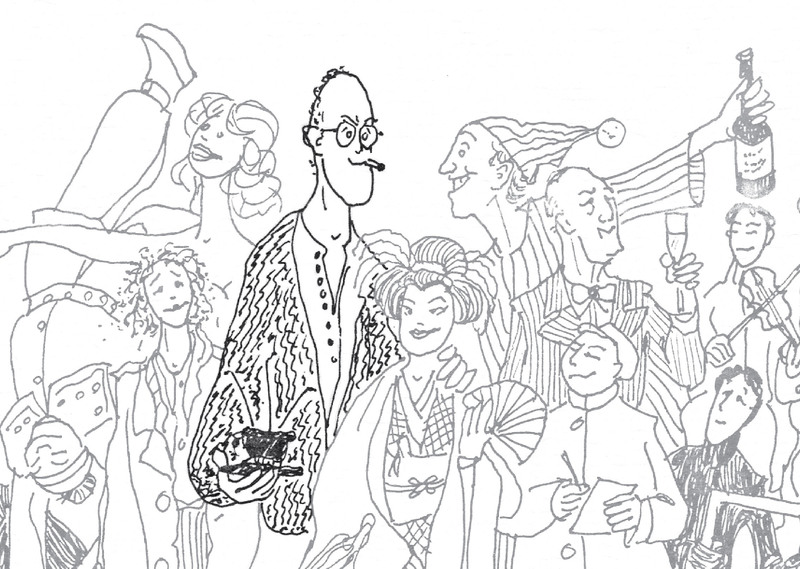 To honor Lithgow as this year’s recipient of the Harvard Arts Medal, Houghton Library presents an exhibition of the actor’s drawings, featuring designs for student productions at the Loeb Drama Center and caricatures depicting his career on Broadway and in television, including memorable performances in M. Butterfly, the hit sitcom 3rd Rock from the Sun, and Netflix’s The Crown. Houghton Library staff celebrate the library’s 75th anniversary with an open house-inspired showcase of its outstanding collections. Fifty archivists, conservators, curators, librarians, specialists, and student workers who make up “Team Houghton” share memorable items encountered during careers at the library that range from four months to over forty years. Gained through providing access to over 600,000 printed books and six miles of manuscript and archival materials that comprise the Houghton collection, the staff’s encyclopedic knowledge of the library comes to the fore in this exhibition. Visit Open House 75 at Houghton or online to discover the library through the eyes of the people who know it best. Born enslaved in British Jamaica, Francis Barber (ca. 1742-1801) grew up, gained his freedom, an education, employment, and married while living in the London household of Dr. Samuel Johnson (1709-1784), the celebrated lexicographer and man of letters. Johnson’s fervent opposition to slavery is recorded in his polemical writings, but found its most radical expression in his naming Barber as his principal heir. 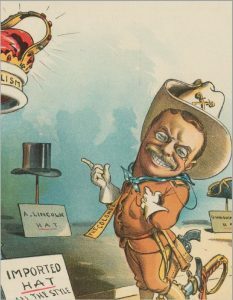 The Donald & Mary Hyde Collection of Dr. Johnson at Houghton Library is home to most of the surviving letters documenting Johnson and Barber’s long-lasting and close relationship, an unusual one for the period. 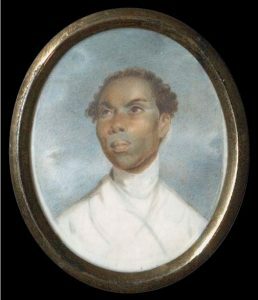 Through a dozen objects, including Barber and Johnson’s letters, portraits, and early biographies of Johnson, this exhibition charts the remarkable trajectory of Barber’s life from slavery to autonomy in eighteenth-century Britain. 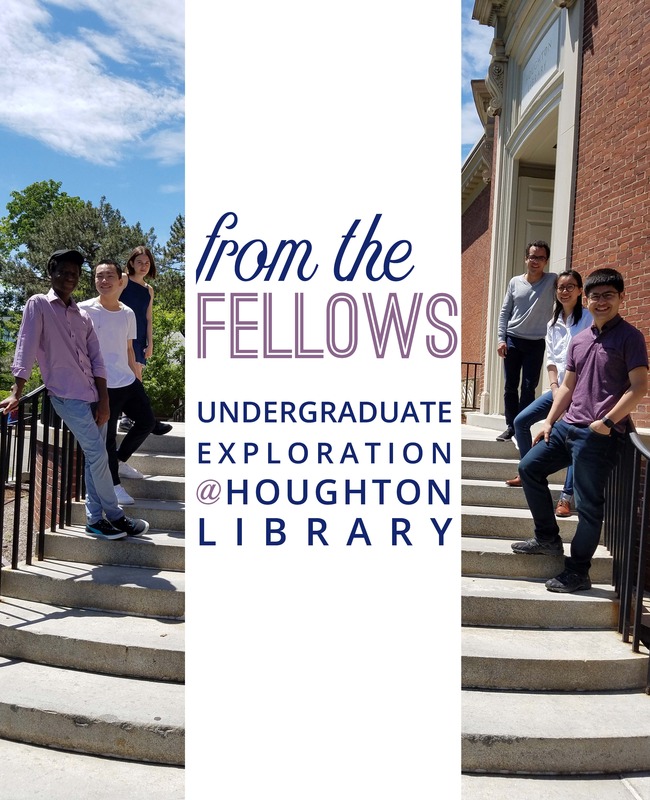 Curated by Houghton 75th Anniversary Fellow Arthur Schott Lopes ’19. 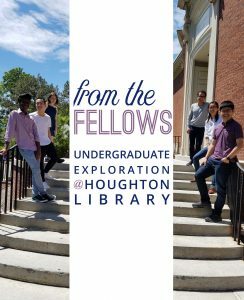 See here for information on Houghton Undergraduate Fellowships. 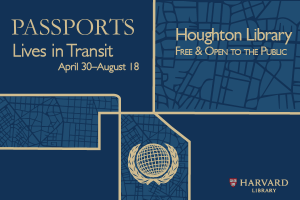 The exhibition is on view during weekly public tours of Houghton on Fridays at 2pm, and by appointment (email houghtonlibrary_events@harvard.edu). This exhibition introduces you to Houghton’s curators, showcases some of their recent acquisitions, and reveals their plans for the future of the collections.